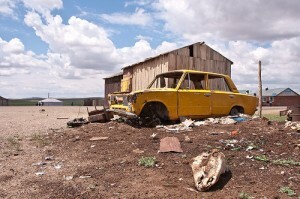 Do you know how many follwers pay attention to the content you share on social media platforms? If you’re like most people, you probably underestimate the size of your actual social media audience because on social media, engagement doesn’t equal reach. 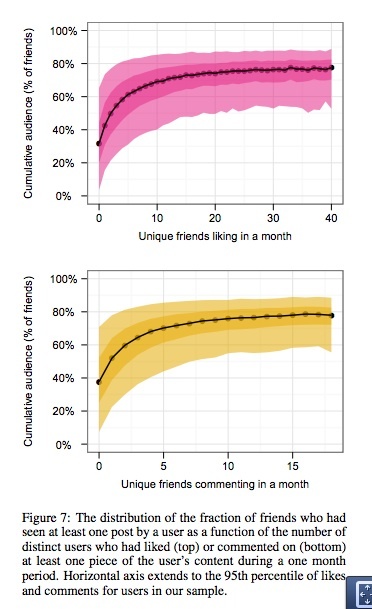 Based on analysis of audience logs for 222,000 Facebook users’ posts during a one-month period plus additional surveys, Michael S. Bernstein, Eytan Bakshy, Moira Burke and Brian Karrer found that publicly visible signals such as friend count, likes, and comments varied widely and didn’t strongly indicate the size of a single post’s audience. Instead, the team noted in Quantifying the Invisible Audience in Social Networks that there are invisible signs of audience attention and behavior in online social networks. As a result, social media reach is wider than can be measured with most commonly used tools. 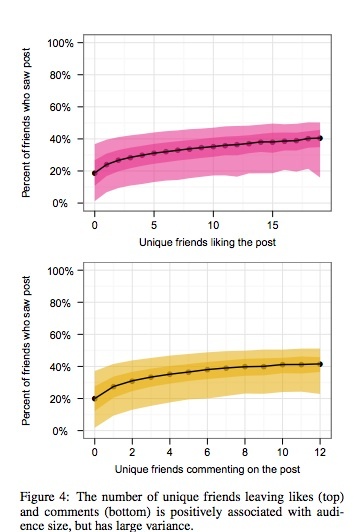 While the proportion of friends who see a post remains relatively stable, the actual number of friends who see a post varies in size. 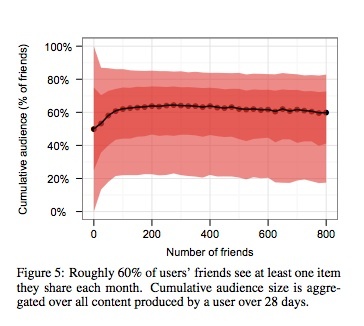 It grows most rapidly as a function of number of friends for people users with less than 200 friends and tapers off for people with more friends. 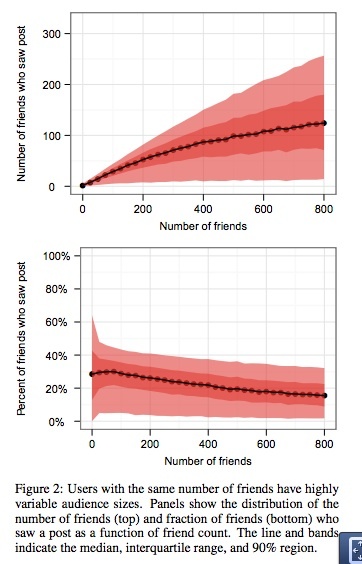 This makes sense because people within a smaller group tend to be more connected to each other while people with lots of connections have less chance to see all of their friends’ content. Yet viewed over the period of one month, there’s a flattening of the graph due to the cumulative effect. As a result, about 60% of a person’s friends see at least one item they share per month out of all of the content they shared in that period. Social media audience size grows rapidly as posts attract additional feedback, although this growth slows when a post has received feedback from 5 unique friends. Posts with no likes or comments had a large variance in audience size. While users were disappointed with posts that receive no feedback, the absence of feedback wasn’t an indicator of reach. Similarly, the proportion of people who had seen at least one post that had at least one like or comment during the month tended to flatten. While half of users want to reach a broader audience, they don’t realize that they’ve already got a significantly larger reach. This is attributable to the fact that they rely on feedback, friend count and past audience size, all of which are highly variable predictors of audience size. To ensure that you continue to reach the largest social media audience possible, here are 3 actionable marketing tips. Post on a consistent schedule. Ignore less reliable indicators such as shares and comments since these indicators don’t tell the true impact of your content. Continue to create and provide useful, quality content for your followers based on your editorial calendar. Share each message multiple times. The key is to alter the timing of your social sharing and to change your content presentation to attract people who may not have seen the content the initial time while not irritating those who saw it the first time. Use factors other than likes and comments to assess reach since these metrics aren’t aligned with actual social media audience. 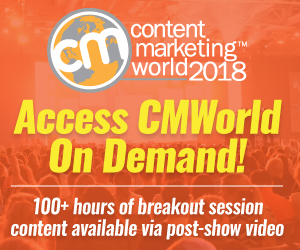 While responding to comments is important for keeping these participants involved, don’t let these easy-to-tract results stop you from creating and sharing additional content. Users’ assessments of social media audience size don’t reflect reality. Specifically, the Stanford-Facebook team found that participants underestimate their audience for specific posts by a factor of four and their audience in general by a factor of three because they don’t receive sufficient feedback to be able to assess their true audience size. 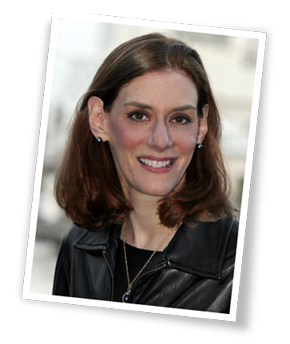 Social media: Do you know your audience? Tags Chart, Facebook, Research, social media audience, Stanford. Bookmark the permalink.